El-Vee had a lucrative beauty parlor on Main Street between a hardware store and a delicatessen. All day long, every day, she stood on her feet, curling, cutting and dyeing hair while listening to an endless stream of blather, innuendo, distasteful personal revelation and catty gossip from her customers. At closing time she was so tired and frazzled, so sick of the sound of the human voice, that she wanted to pull out her own hair, but she looked at all that beautiful cash in the cash drawer and that was what made it all worth the effort. One Friday afternoon (Friday was always her busiest day), while she was just finishing up on up on Mrs. Coolidge’s hair—a foot-high confection of swirling, pink-tinged white cloud—she heard the roar of a truck outside and loud voices and, looking out the window, saw that a new business was moving in across the street. As she was to learn a few days later, when the place opened for business, it was called Gertrude’s Wig Shop. It boasted in signs in the windows its stock of wigs of all kinds, hairpieces, hats, scarves, turbans, babushkas, and other assorted headwear for women and girls. At first she wasn’t sure how a wig shop was going to affect her beauty parlor business, or if it would affect it at all. When they put up a huge sign across the front of the wig shop that proclaimed in large red letters You Don’t Need a Beauty Parlor—You Need a Wig!, she was disconcerted, believing it was a direct shot across the bow of her ship. When she saw a full-page ad for the wig shop in the newspaper, she began to be worried. The ad read, in part: Don’t Spend Beaucoup Dollars Getting Your Hair Styled Every Week! Buy a Wig Instead that Stays Styled! Nobody Will Ever Know It’s Not Your Real Hair! Wondering if such tactics were legal, she consulted a lawyer, a boy she had known since seventh grade named Leroy Follett. When she began to see a falling off in her business and hence in her profits, she attributed it to curiosity. Her customers would flirt with the idea of buying a wig but then would return to their old habits of having their twigs twisted every week. Wigs were fakery, no matter how good they looked. There was nothing like one’s natural hair, even if it was brittle, ugly, thinning and unhealthy-looking. To try to lure in new customers—and retain her old ones—she hired a manicure girl and offered free manicures. Then she hired a cosmetologist to give facials and makeup tips. These two extra people ate into her profits, of course, but she believed that hiring them would prove beneficial—in the long term if not in the short term. After a few weeks, she and her two new employees were doing a lot of sitting around doing nothing in the long gaps—sometimes two hours—between customers. She began to worry about how she was going to meet expenses for the month when she decided to go across the street to the wig shop herself, something she had vehemently avoided doing before, to see what all the excitement was about. She winced when she saw how busy the store was and how many people were spending money. When a sales clerk came forward and asked her if she needed help, she said she needed to speak to Gertrude herself. 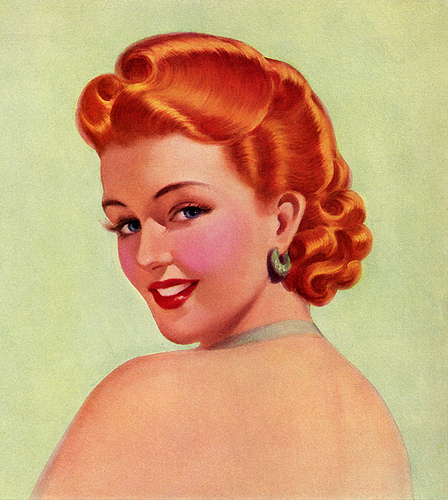 Gertrude was a large, broad-shouldered woman with red hair and lots of makeup. As she approached El-Vee, she wore her fixed, professional smile. “Help you?” she asked. “Are you Gertrude?” El-Vee asked. “I could always bust you in the nose,” El-Vee said. That night, as El-Vee was trying to get to sleep, a thought came to her unbidden from deep in the recesses of her mind. Gertrude was somebody she had known at one time, although she couldn’t remember the last name. She got out of bed and pulled a box from the back of the closet. She hadn’t looked at her old high school yearbook or even thought about it in a dozen or more years. She turned on the light and sat down on the couch and began thumbing through the pages. Soon she found what she was looking for: seventeen-year-old Gertrude Bines in the eleventh grade—elaborate red hairdo, self-satisfied smile and a “beauty mark” on her cheek. It all came back to her. She and Gertrude had been rivals in high school. Rivals for homecoming queen, rivals for yearbook editor and rivals for love. (They fought over the school’s star football player who turned out to prefer members of his own gender). They both seemed to be good at the same things. If one of them could bake a lemon cake, the other could make a lemon chiffon cake. If one of them could make a party dress, the other could make an evening gown. El-Vee hated rivalry then and she hated it now. Rivalry only made life more difficult and ruined everything. In a perfect world, she thought, she would always be at the top of the heap and there’d be no such thing as rivalry. With a flick of a switch, she’d make it disappear. She contacted her brother, Everett Persons (the one of her three brothers who flirted with gangsterhood), and asked him to meet her at a restaurant out on the highway for supper. She was buying, she said, and she had something she wanted to talk over with him. “How about a little fear and intimidation? Death threats? A brick through the front window? “Oh, don’t worry about me!” El-Vee said. One morning a few days later when El-Vee was alone in the beauty parlor before her first customer arrived, Gertrude Bines came rushing in. “I need to speak to you,” she said. “My store was broken into last night,” Gertrude said. “I think you know who did it,” Gertrude said. “I didn’t give it a thought,” El-Vee said. “Why don’t you admit you’re defeated?” Gertrude said. “My hair is perfect,” Gertrude said. Gertrude sighed and sat in the chair. El-Vee put the cape around her shoulders and turned the chair around just so. “You do remember me from high school, don’t you?” Gertrude asked. “We needn’t have any bad feelings,” Gertrude said. “I want to make you a business proposition,” Gertrude said. “Go ahead and make it,” El-Vee said. “I don’t think I could stand to work for you,” El-Vee said. El-Vee picked up her longest, sharpest scissors and plunged them into Gertrude’s neck, severing the carotid artery. With blood gushing from her neck, Gertrude fell to the floor and flopped around like a fish out of water. She tried to pull herself up but couldn’t. She burbled blood out of her mouth until she lay still and stopped breathing. When El-Vee was sure Gertrude was dead, she dragged her body by the ankles across the floor, opened the door to the dank cellar that was never used, and pushed her down the stairs. After cleaning up the blood the best she could, she was ready to receive her first customer of the day. The next morning El-Vee was snipping away at an old lady’s hair when she looked up to see three men coming across the street toward her: an older man in a suit, flanked on both sides by young, uniformed police officers. She stood up straight, took a couple of deep breaths to steady herself, and went to the door to meet them. If she was kind to them and cooperative, they would have no reason to suspect she had done anything wrong.